Joseph Hodgson’s life-saving exploits were recounted in The Illustrated London News of 17 April 1858. The account, compiled by Bill Fevyer, was reprinted in the L.S.A.R.S.J. No.31, p.25-27. 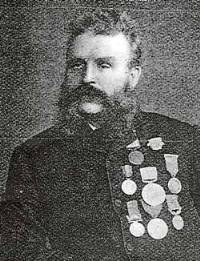 ‘Mr Joseph Hodgson … is a resident of Sunderland, and has signally distinguished himself on the north-east coast by his heroic exertions to save life from shipwreck. He possesses silver medals from the Royal Humane Society, from the National Life-boat Institution, from the Board of Trade, and a first-class gold medal from the French Emperor for saving the crew of a French vessel. He has himself saved twelve persons from drowning, besides having been, with others, the happy means of rescuing a great number of human lives. In stormy weather he is seldom off the beach, and hence the title of ‘The Stormy Petrel’, by which he is so well known. On one occasion Mr Hodgson saved a baby, bringing it on shore wrapped up in his coat, in the slings of the rocket apparatus; then, returning to the vessel, he brought thence the mother safe to land. 1844 he saved the life of John Snowdon, a child of about two years, by jumping off the quay into the River Wear. 1846 he saved John Nicholson’s life by jumping off the quay into the River Wear, near the Custom House. 1847 he saved the lives of John Marshall, by jumping off a keel into the River Wear, near the ferry-boat landing; of Joseph Alexander, who was knocked overboard by a keel’s tiller; and of William Cornage, a seaman, who fell into the river: in this latter case he was called out of bed’. 1849 he rescued John McTun, a seaman, who was washed from the life-boat, by going into the sea for him, during the wreck of the Tyneside. 1852 he assisted in saving the crew of the ship Thomas Clarkson. 1854 he assisted in saving the crew of the Medina, and that of the Harmony, of London, on January 4; and on the 9th of the same month, the Samuel and Sarah, billyboy, of Grimsby, going on shore behind the South Pier, he succeeded in getting to the vessel and first brought to land the captain’s child, eight months old, then returned with rocket-lines and brought the captain’s wife. In October he, with the assistance of five others, saved from the wreck of the Niagara a lad who had been left on board in bed sick. On November 15 he assisted in saving the crews of the Victoria, the Coldstream, the Calypso, and the Margaret. 1855 he saved (October 30), with the assistance of Joseph Clark, the captain of the Brig Brenda, wrecked behind the South Pier, who had been left on board. 1856 he assisted (September 28) in saving the crew of the Madalenea, wrecked on the Glass Heads, behind South Pier. 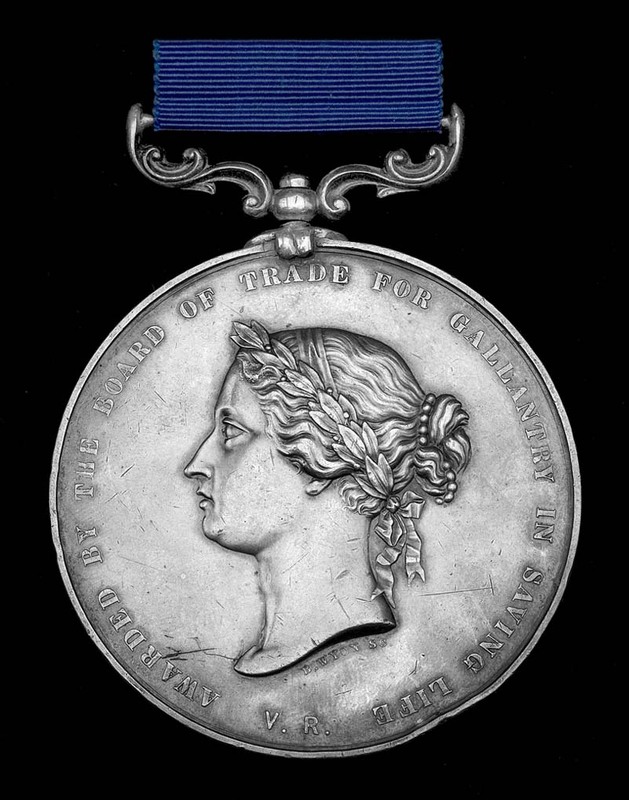 The date of award of the Board of Trade Medal for Gallantry in Saving Life at Sea (medal instituted in 1855) makes it one of the earliest issued. In his article, Mr Fevyer reported that a search of the archives of the Royal Humane Society had failed to find any award made to Hodgson and speculated that the medal awarded was possibly that of the Sunderland Humane Society which was known to be active at the time. Hodgson was awarded the R.N.L.I. Medal in Silver in 1856. In the Life-Boat, 1 April 1857 it states, ‘Jan. 3 1856 – The Committee voted the silver medal of the Institution, and their thanks, inscribed on vellum, to Mr Joseph Hodgson, of Sunderland, in testimony of his extraordinary exertions, extending over a period of twelve years, in saving life. He had personally rescued 10 persons from drowning, and had assisted, in life-boats and other boats, in saving about 17 others’. A similar citation is given in Lifeboat Gallantry but there his name is given as ‘Joseph Carver Hodgson’.